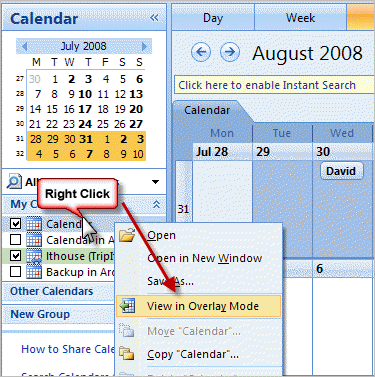 Microsoft Outlook 2007 has some useful calendaring features for people with several calendars. One feature allows you to view calendars side-by-side. There are also times when I need to overlay or even merge multiple Outlook calendars. These days, it’s not uncommon for people to have multiple calendars. You might have one for family, sports teams, schools, organizations or travel plans. In many cases, you don’t want to combine your main calendar with your favorite sports team. Rather than displaying the calendars in a side-by-side view which can be difficult to spot differences, Outlook allows you to overlay the calendars. Each calendar has its own tab, but the color coded consolidated view better reveals conflicts and opportunities. Check two or more calendars you’d like to see. Right-click one of the checked calendars. Select View in Overlay Mode from the menu. Sometimes, I want to combine two Outlook calendars. One reason is some syncing programs fail to sync multiple calendars to my phone. Another reason is some calendars are “read-only” and I can’t edit the information. For example, I like to combine my travel calendar feed from a 3rd party service into my main calendar. Microsoft Outlook doesn’t provide a menu option that will merge or combine calendars. The workaround is to export the secondary calendar and import it into your main calendar. This process works well for calendars you create, but you should verify none of the calendars are internet calendars or published calendars. Removing shared calendars will impact updates. 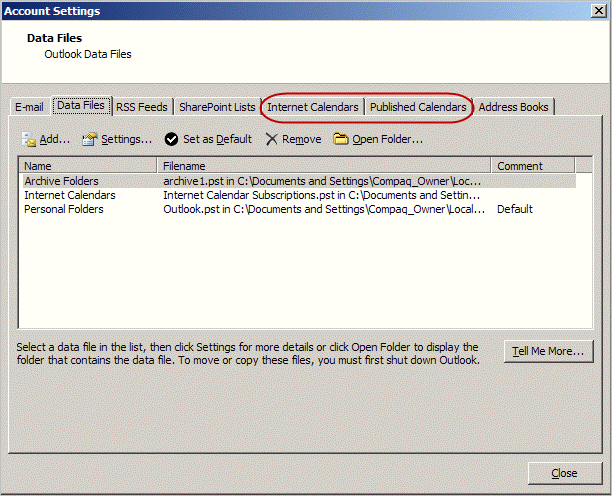 You can verify if you have any of these calendar types by going to File | Data Management. There are tabs for each of these items. Even though my travel calendar is an internet calendar, I’m comfortable removing it after the merge because I don’t anticipate any changes. In my case, I could always resubscribe to it. In the Import and Export Wizard, select Export to a file. In the Export to a File panel, select Comma Separated Values (DOS). In the Select folder to export from section, select your secondary calendar file. It may show in a different area like Internet Calendars. Note the exported file name and path. Because we’ll be importing this file back into Outlook, you can skip Map Custom fields…. Provide a data range for the exported calendar. The above process exported your secondary calendar to a CSV file. The remaining part is to import this file into your main calendar. As you might expect the process is similar. In the Import and Export Wizard, select Import from another program or file. In the Select file type to import from panel, select Comma Separated Values (DOS). In the File to import: section, make sure the CSV file you just exported shows. If not, browse to the file. In the Options: section, select the radio button that suits you needs. Confirm the listed action and click Finish. Review your main calendar to make sure it shows entries from both. The last step is to delete your secondary calendar. If you’re not comfortable with deleting it, uncheck it so it doesn’t display in Microsoft Outlook.